I wrote a version of this post for the Workfront blog. I have been in marketing in some form or fashion for 28 years. During much of that span, marketers’ roles, including my own, were delineated and codified. The org chart and process flows dictated precisely what you did, when, with whom, and who approved it and took your output to the next step. In this way, marketing has been little different from a Henry Ford-esque assembly line, with the additions of a dose of creativity, Excel, trade show swag, and cool business cards. But in my work running a marketing and customer experience consultancy, and interacting with hundreds of companies each year as an inspirational marketing keynote speaker, I have come to believe that the era of the marketing org chart as we have known it is coming to a close. The rapid and rampant integration of marketing disciplines that were once quite separate creates a cross-functional bouillabaisse that is ill suited to inflexible roles and job descriptions. What does a social media manager do now? Not long ago, he or she was primarily a writer, using sentence fragments to stoke the passions of customers. Now, that same position may require robust photography, video editing, paid advertising, and analytics capabilities. And how does that social media manager differ from or intersect with a content marketing manager? Is a video social or content? Is YouTube a social network or a content platform? And what about customer service? Is Twitter a marketing channel or a customer service channel? Does the social media manager using Twitter to delight potential customers also handle inquiries from current customers needing support? Is Facebook a marketing channel or a support channel? The same question applies to Facebook Messenger, perhaps even more so. What does a “designer” in a marketing team do today, when front-line social media managers can create credible graphics on-the-fly using low cost (even free) tools? What does a “media buyer” do in the social era, when paid promotion occurs on Facebook, Twitter, Instagram, Pinterest and beyond – the historical dominion of the social media manager? I’m not at all suggesting that social media managers are somehow the lynchpin of modern marketing. But I am using the maelstrom of disruption that social media causes to historical job roles to suggest something else entirely: The marketing org chart has met its match. I believe the most effective marketing teams going forward will have very few – if any – distinct job titles and roles. Instead, these teams will be increasingly comprised by generalists that know a lot about a lot, without specializing in any one element of marketing. These highly functional teams will have a collective cornucopia of skills, with individual team members working together in an impermanent capacity to tackle particular assignments, campaigns, and projects. To make this system viable, smart teams will purposefully collect multiple team members with overlapping and duplicate skills, so that if simultaneous projects have a direct mail component, for example, each project team has a different marketer filling that need for the duration of the project. This eliminates bottlenecks and gives the collective far more ability to be flexible, nimble and deadline-aware. There are two outcomes of this movement. These limiters will become unnecessary because the best marketers will possess many of these skills, making the marketing generalist the most valuable of the species. Second, software that enables ad-hoc teams to assemble for particular projects and then disassemble and move on to the next assignment will become essential. Software that understands who has what skills. Software that can recommend team members based on their capabilities and experiences. Software that can keep cross-functional marketers on time and on task. But software isn’t the only answer. As always, success is more about the wizard than the wand. The collaborative environment required to operate in the hyper-flexible capacity I’ve described cannot and will not just emerge from the primordial ooze of Paleozoic marketing departments. True collaboration requires management support from the highest levels. It requires attracting and retaining marketers that do not fear a workplace without an org chart, but instead thrive on the nimbleness it unlocks. That’s a colossal HR challenge, and will take quite some time to achieve. This environment requires a true spirit of mutual respect and support. Without a defined org chart, the internal politics of marketing “success” can be set aside. But without that internal scoreboard of who reports to whom to serve as a psychological scaffolding, can marketers really cooperate in real-time for the good of everyone, or will they devolve into ungoverned rabble, like The Lord of the Flies set around a conference table? 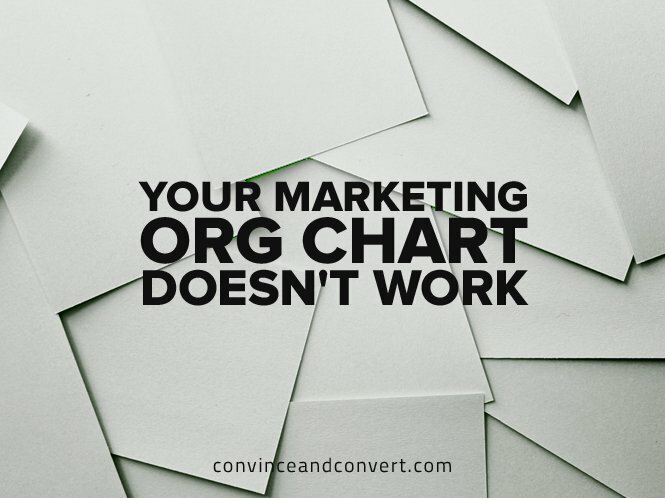 A marketing team without an org chart better have every single member on board with the concept, and that will require hiring for outlook as much as hiring for skills. But it can work, and we’ll start to see evidence of it in many organizations, in short order. For a long, long, long time marketing has been a collection of siloed, vertical specialists doing siloed, vertical work. Not anymore. The era of the org chart is ending, and in its place is the new era of amoeba-like, horizontal generalists (assisted by software) that get more done in less time. Agree? Disagree? Let me know below.